Arawn thought of Mair, the last of his wives. It had only been two years but already he had trouble recalling her young face. “I tried that, too,” he admitted. Arawn shifted in his saddle, his chest clamping even harder. “You are young, Uther. You do not understand the challenges of a ruler.” His tone was sharper than he intended. Uther was brazen and his questions impertinent. Ambrosius had thrust Uther at Arawn, to smooth out his brother’s rougher edges. The man would not learn subtlety living in the middle of an army camp as he did in Carnac. Uther stared at his horse’s ears and said nothing. He was sensitive enough to know he had overstepped his bounds. “Suitable?” Uther repeated. “A cursed king cannot demand his next wife meet any standards.” His smile made his eyes dance. “I will not be inviting you to the wedding, then,” Arawn replied. Uther’s laughter sent a raven flapping into the air, cawing his objection. The other men were far behind them, now, busy with their own conversations. Winoc was far ahead. It was just the two of them, which let Arawn relax a little more. “It would be nice if she was of passing prettiness,” Arawn added, warming to the subject. “And with all her teeth, too,” Uther said. “It is your bed we are planning to fill, not mine,” Uther replied, his tone urbane. “Of course, she must be a maiden,” Arawn said. Arawn laughed at the notion. “Then why not add a wedding to your list?” Uther asked with a reasonable tone. Arawn tried to consider the matter in the straightforward way that Uther was. Stripped of the burden of emotions, the concept of marriage to any woman was reduced to nothing more than a step on the path to breaking the curse. Following forms and protocol had not served him. He had not lied–he would do anything to see his people suffer no more. Anything. “The first young, healthy, marriable woman,” Arawn amended. Will she become the cursed king’s fifth dead wife? In Lesser Britain, drought grips the land, forcing Arawn, King of Brocéliande, to take a fifth wife, hoping she will be the mother of his firstborn, whom the prophecy says will break the curse and save his people. Ilsa, daughter of a wood cutter, is brought to Lorient to wed the cold, distant Arawn, terrified she will become the king’s next dead wife. There she learns about the true High King of Britain, Ambrosius, and his brother Uther, who build an army to take back Britain from the Saxons and Vortigern the Usurper. Can Arawn find a way to save his people and the land that supports the future Pendragon? Will Ilsa break the curse? What stands out for me about this story is the strong female lead and her determination to make the best of her lot. She’s in an unusual situation but as evidenced by her hardships thus far in life she knows how to adapt and make things better when and how she can. Tracy Cooper-Posey’s writing is rich in interesting and relevant historical details with an amazing slice-of-life approach which means we feel a part of the story. One of my favourite aspects of this novel is the changing interactions and developing relationship between the main characters. I enjoyed tagging along for their journey of self discovery and growing fondness for each other. Seemingly thrown together by chance I loved that the two leads both change and learn from each other. I enjoyed learning more about previous characters in the series too and where their lives had led them with the passage of time. A very satisfying place to leave these lovers but with so much more to look forward to in the overall story I’m eagerly anticipating the next book(s) in the series. You will not regret reading this book. Once I got started, I couldn't put it down. I love the characters and the twists and turns in the story are great. I love that the women aren’t helpless, but are valued for their contributions during difficult years. The love story between a king and a woodcutter’s daughter is believable. I thought the characters were well developed and the story-line kept me interested! I always get excited when Tracy releases a new book! She is one of my favourite of my favourite all time authors. I loved the storyline and all the twists and turns. Couldn’t put it down. It was captivating and mesmerizing. You simply have to read this book. You will not be disappointed. I am a paranormal lover so I was hesitant about this story from the beginning. I liked the historical details and a lot of research must have gone into this book. But I must confess I was a little disappointed in the characters and the love story. For me they just didn't come to life and as a consequence this story didn't grab me as other novels by this author did. I would have liked a bit more focus on the characters. This book felt to me more like a history book than a (romantic) novel. Having loved Arthur & the round table for as long as I can remember really swung this book for me, so I'm looking forward to the whole series. King Arawn was a wee bit of a sad man even in them days believing in curses but he did. A lady was the only one who break it, who other Ilsa was out hunting for her family, to feed them in the hard times & guess who she came over.? Wow this was some story, I just loved it & how everything came about, both the king & Ilsa went through a lot of trials & tribulations throughout their time together, but they came to understand each other. Other kings from other kingdoms mainly saxon/Viking & roman seemed to treat their wives more like trophies, Awran seemed to be getting real feelings for Ilsa & she for him as their time was getting longer & they seemed to understand each other. The giving of the new ring really brought it home to me how Arawn loved Ilsa, a ring within a ring was a lovely touch. Loved this book it was a great read, all the historical work that must've gone into it, would've ben a lot of hard work. (I loved this kind of history!) Thank you. I first fell in love with the Arthurian cycle with Marion Zimmer Bradley when I was but a kid. Now, years later, I can appreciate the fine narrative that Tracy Cooper-Posey delivers. Bear in mind this is not the typical historical romance, it's even better. It's a slow burning story which started more than a decade ago in Born of No Man- such an interesting way to introduce Merlin, by the way. Dagon Kin is the story of the cursed King Arawn of Brocéliande and her Queen Ilse. Ilse is supposed to help Arawn broke his curse bearing his first child. At the end, this is a story of loyalty, personal growth and slow path to love. What I LOVE the most is the strong female characters and how they evolve through the book, along with the others. So, if you like the Arthurian myths and British medieval history don’t hesitate to pick up the series, we are bound to a long ride! This series puts Tracy Cooper Posey up there with the great Arthurian writers like Stewart and Bradley. Her vivid descriptions and historical snippets add so much to an already great story that I could not put it down. I cannot wait for the next book. I am paranormal lover, so I was trying my best to stay away from historical romance. To be honest, the first thing the came to my mind was "what am I doing". I don't like this kind of books. But I have to give it a try. Like always, Tracy Cooper never let me down. I start the book and the feeling the I have in every single line was, "I need to know what is going to happen". The suspense was killing me, because I was trying to predict whats going to happens next and something different comes. The agony to know about the story was killing me, but nothing the I was predicting was coming. Things was getting even better and better. The turn of events in the story was amazing and kept me glue to my tablet. I wasn't disappointed at all. Now I am a fan and I can't wait to read more. I usually stay away from historical romances but this writer gave me hope that it would be worth the read and she didn’t disappoint. This story took a hold of me and would not let go. I highly recommend this book. Tracy has not disappointed anyone who has or will read her new Historical Romance. The 2nd book takes more the time where magic and soothsaying was believed. We also learn that Merlin gift was becoming strong. If you enjoy reading about the medieval era.....about Sorcerers and magic that has found a way into those times; Tracy's new series Once and Future Hearts will be a series you will not want to miss. 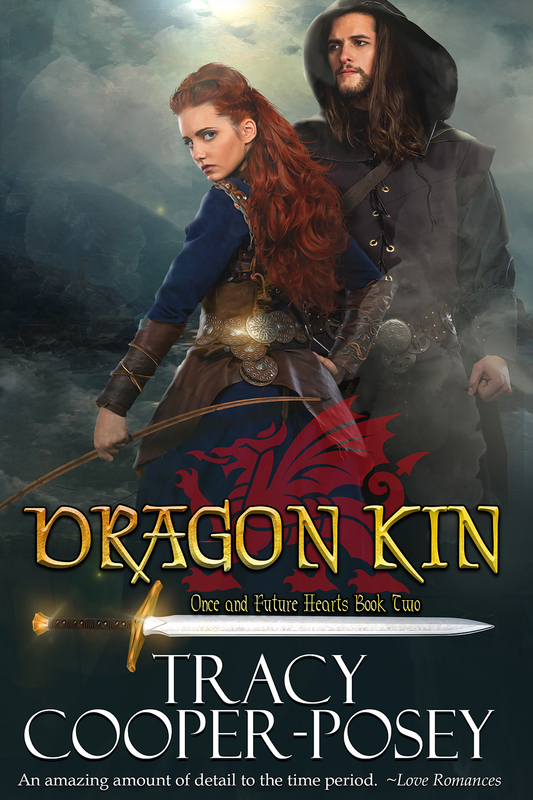 The second book of this series Dragon Kin kept me so enthralled,I was sorry to see the end of the book. I cannot wait for the Third book and knowing Tracy's way of weaving a great story; I know it will not be boring.